The heavens tremble and the planet quakes as the souls of heroes and villains teeter on the edge of darkness and light. The Flame Alchemist¹s rebel army pushes the forces of Central to the brink of collapse ­ until the enemy¹s fallen leader returns to take control. As mortals and monsters wage war, young Edward and Alphonse Elric must face a cruel being with the unholy power of a god. After endless adventures and countless struggles, the boys find the fate of the world in their weary hands. When the Gateway closes and the circle is complete ­ who will be left alive to celebrate the astonishing sacrifices made...? Fullmetal Alchemist: Brotherhood (originally called Hagane no Renkinjutsushi: Fullmetal Alchemist in Japan) is a 64-episode (and four OVA) anime series directed by Yasuhiro Irie (who served as animation director on the 2003 Fullmetal Alchemist series) and written by Hiroshi Ōnogi (Heat Guy J, Mobile Suit Gundam). 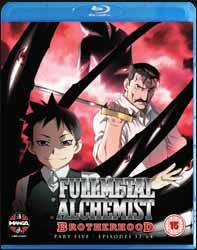 This is the second Fullmetal Alchemist series to be produced by animation studio Bones, but unlike the 2003-04 series this 2009-10 series follows Hiromu Arakawa's manga series a lot more closely. In this final volume (which covers episodes 53-64) everything comes to a head. The remaining homunculi are slowly confronted and the Elric brothers finally have the opportunity to put things right. As the show slowly concludes, I couldn't help thinking they were milking it for all it's worth. Not that I'm complaining, but episode 63 really drags on... and so does the final episode. Now there are a lot of characters to service, and all the loose ends need tying up, and to be fair to do the show justice and give the fans something they can be proud of have followed for 64 episodes, I can't think of a more fitting way to wrap things up. Extras include an audio commentary for episode 64; textless opening and closing titles and, to my mind the best extra in the series, Outtakes (7 min, 33 sec which has the American dub actors fluffing their lines, as well as deliberately having fun by changing the odd line for comic effect). If I had one complaint, it's that this collection would have easily fitted on a single disc. So, to charge £30 is a little on the steep side. Otherwise, this is a flawless conclusion to a remarkable show.